A stone may move forwards or sideways to an adjacent empty cell. Capture occurs by jumping diagonally forward over an enemy stone, landing on the immediate empty cell. Capture is mandatory but not multiple (maximum of one captured stone per turn). A player wins if he places one of his stones on the last row (or captures all enemy pieces). Stalemate also counts as win. 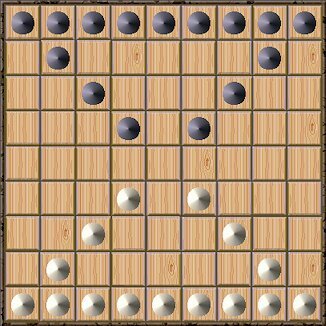 Fianco is played on a 9x9 board, but I have also implemented an 8x8 variant. (Personally, I think it is better played on a regular chess board.) Fianco was invented by Fred Horn in 1987. Alternatively, Fianco could be played on an 8x8 chess board.